Marc, Dan and I snuck out of the retreat on Saturday afternoon to check out boats in Pt. Townsend. As we were walking the docks we meet Robert d'Arcy who Skippers the one hundred year old racing schooner, Martha. He and his wife run sailing camps for youth all summer long. The boat is owned by a foundation which sponsors the restoration and operation of this historical vessel. 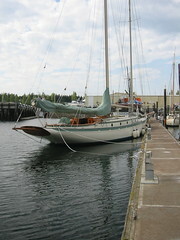 Robert and his wife take about six young people at a time out on week long cruises in the Puget Sound and British Columbia. She is a beautiful wooden boat and just received a new paint job. We also checked out Point Hudson before returning to Fort Flagler.